Enjoy superb sound quality without bulky cabinet speakers crowding the room. 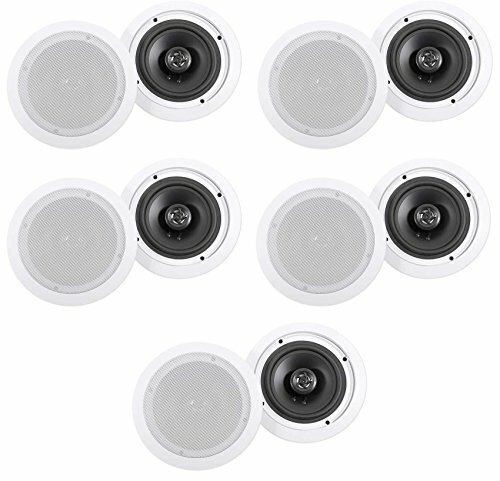 These ceiling speakers are precision tuned for excellent audio response at high and low volumes. These speakers are perfect for both large and small rooms. For larger rooms you can install 8 or more of them while in smaller rooms 2 or 4 will fill the room. These are perfect for complete home systems where you want to install speakers in multiple rooms. These in-ceiling speakers feature a 6.5" polypropylene cone for clear, rich mids and deep bass. Rubber surrounds eliminate unwanted distortion so all your music sounds loud and clear. Our mylar dome tweeter provides clean, crisp highs. Each pair puts out 160 watts RMS and 500 watts of peak power! This is more than enough power to fill large rooms. The included sheer grill enables flush installation and can be painted to match any décor. Our spring loaded push terminals are gold plated and supply a perfect signal from your amp or receiver. These speakers will outperform other speakers on the market that sell for $125 and up. We also are offering a 90 day money back guarantee including return shipping. If you are not 100% satisfied with these we will send you a pre-paid shipping label and take them back and refund all of your money. Pair of Rockville HC655 6.5" White 500 Watt 2-Way In-Ceiling Home Theater Speakers. Peak Power Handling: 250 Watts (per speaker) / 500 Watts (per pair). RMS Power Handling: 80 Watts (per speaker) / 160 Watts (per pair). Polypropylene Cone . Rubber Surround. 6.5" Woofer. 1" Aluminum Voice Coil. ½" Mylar Dome Tweeter. 10 oz. Ferrite Magnet. High Quality Spring Loaded Push Terminals. Paintable Flush Mount Grills. Frequency Response: 60Hz - 20KHz. Sensitivity: 89dB @ 1w / 1m. Impedance: 8 Ohms. Mounting Depth: 2.91". Cut-out Diameter: 7.6". Color: White (paintable).